Raised in the Adirondack Mountains of upstate New York, Lee became interested in folk music while in high school. During college, he became familiar with the music and stories of the Southern Appalachian Mountains, as well as of the Adirondacks. He wanted to learn the music and stories from traditional sources--people who had them as part of their culture and community for generations. He also collected songs and stories from other parts of the world, including England, Scotland, Central Asia, Columbia and the Amazon region of Peru. Lee currently works as a folk singer, story teller and outdoor leader, performing at concerts, workshops, Elderhostels, festivals, camps and schools. He leads hikes, canoe trips and guides whitewater rafts. He plays various instruments, including the five-string banjo, various guitars, the Appalachian dulcimer, the mouth bow, the Cherokee flute and the Cherokee rattle, as well as the Native American drum. Recently, Lee released the CD FROM THE APPALACHIANS and is currently working on a new CD of folk songs from the Adirondacks. In August 2003, Lee recorded with Chinese pipa artist Wu Man, who has recorded with Yo Yo Ma and the Kronos Quartet. He is currently working on a book of Adirondak ballads and folk songs as recorded by Majorie Lansing Porter in the 1940's and 1950's. In addition to having performed throughout much of the eastern United States and Canada as well as Scotland and Tashkent, Lee appears regularly at the Asheville Mountain Dance and Folk Song Festival and the Lake Junaluska Folk Festival. Lee did the music and voice-over for the documentary video The Nantahala: Land of the Noonday Sun. 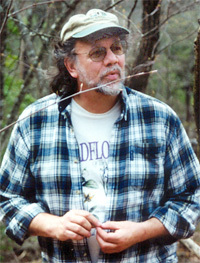 He has participated in artist-in-residence programs with the South Carolina Arts Commission, the North Carolina Arts Council, the Tennessee Performing Arts Foundation & the Georgia Arts Council. To contact Lee for further information or for booking information, contact him directly at the address or phone number below.